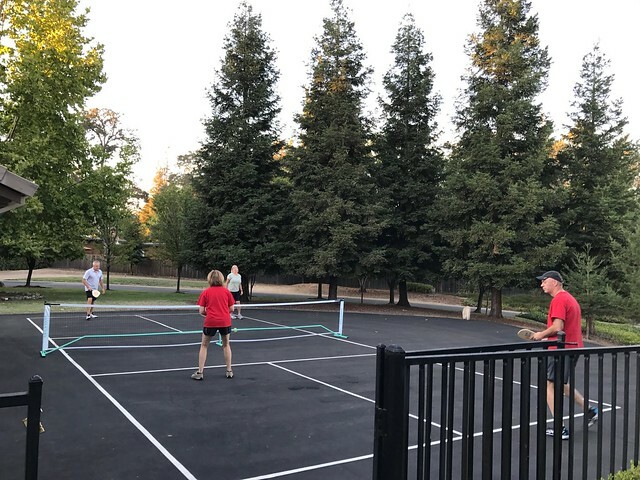 Sharon and I played pickleball with our neighbors Greg and Michele and Jim and Deborah. Greg and Michele have a court in their driveway. Wikipedia says that pickleball is a racquet sport that combines elements of badminton, tennis, and table tennis. I have watched them play, but was surprised to find that the game uses a deadened wiffle ball. The ball doesn't bounce like a tennis ball would! The paddle is like a giant table tennis paddle. After playing a few matches, Greg and Michele had everyone in for a nice dinner of salmon, green beans and potatoes.